Spend the day at Dubai's Wild Wadi Water Park on this package that includes admission tickets and private round-trip hotel transfers. An array of rides awaits you, ensuring a day of family fun and excitement and a refreshing break in the summertime. 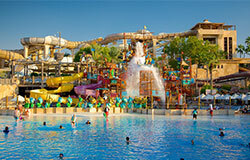 Wild wadi is the best water park with highest water slides, flood river flayer, summit surge, diving down, twist and turns, flow rides, thrills and spills, high power jets, aquatic roller coaster, tunnel of doom and many more. If you like to live on the edge, why not give our wipe out flow riders a go? Entrance Ticket to Wild Wadi Theme Park. Exciting rides suitable for all ages available.